For rods of 13' and longer. 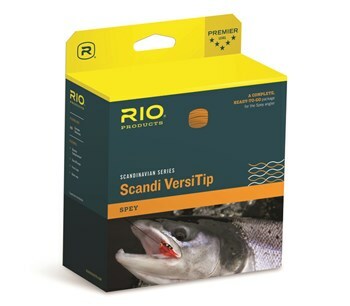 RIO's Scandi VersiTip is a highly versatile, interchangeable tip Scandi style shooting head, that allows anglers to change tips quickly and easily as fishing conditions change. It is ideal for the travelling angler, so that they can travel light, yet be prepared for any condition.The package includes a 23ft floating Scandi body and four, 15 ft long interchangeable tips, making a total head length of 38ft. The included tips in each package are floating, intermediate, type 3 and type 6 DC sink. The package does not include a shooting line, so anglers will need to purchase a shooting line before this can be used. RIO recommends GRIPSHOOTER for maximum distance, or CONNECTCORE shooting line for the very best in hook sets and fishability. This Scandi VersiTip is ideal for rods of 13ft and longer, and is available in #7 to #11. All tips, and the body are built on RIO's ultra-low stretch ConnectCore for the very best in control and sensitivity. Rio Powerflex Shooting Running Line is built with a super slick, XS technology coating that ensures the longest of casts.